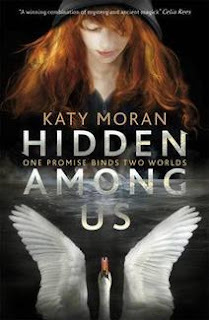 For me, it can be a bit hit-or-miss when it comes to YA books about fae creatures, so I was a little unsure when I started Hidden Among Us by Katy Moran. I hadn't read any of the author's previous books and wasn't sure what to expect at all. Happily, Hidden Among Us is really fast-paced and interesting, introducing us to some fascinating characters and lots of mystery and I'm really quite looking forward to reading more in this series! The first few pages of the story are incredibly tense and exciting and these strong feelings right from the beginning are what hooked me into Hidden Among Us, and that level of excitement is really carried on throughout the rest of the story. I loved the different narrators. Sometimes it can be a bit hard to differentiate between multiple perspectives, like in this story, but it's nicely laid out with different fonts and each character's voice is strong enough to maintain high levels of interest even at a chapter break after some tense moment has just occurred. We hear this story from the points of view of three main character and the occasional thread from others as well. But mostly from Lissy, her brother, Rafe and Joe, her mother's boyfriend's son. I like how the information about The Hidden, the ranch they're all staying in and the way in which Lissy and her mother have a history with the elven are all leaked to the reader and to Rafe, Lissy and Joe slowly. I liked having to piece together the bits of information to form this greater picture alongside the main characters. And while The Hidden are fascinating to learn about, and the pace was kept quite fast, with lots of mystery going on, I think what I loved the most about the book were the characters. Especially that of Rafe and Joe. You can tell from the way in which Rafe decides to steal from the British library and this subsequent car chase, that he really cares about Lissy and will do anything to find out more in order to protect her. And also Joe, who has such strong feelings and does things to protect Lissy, almost without thinking, is pretty fantastic. Everyone is racing against a timeline here with this bargain that was struck between Lissy's family and The Hidden plus there's some shady people circling which was quite enough to get me to furiously continue reading. I really recommend that you pick up this book and do the same!